Octavia E. Butler (1947–2006) was a bestselling and award-winning author, considered one of the best science fiction writers of her generation. She received both the Hugo and Nebula Awards, and in 1995 became the first author of science fiction to receive a MacArthur Fellowship. She was also awarded the prestigious PEN Lifetime Achievement Award in 2000. Her first novel, Patternmaster (1976), was praised both for its imaginative vision and for Butler’s powerful prose, and spawned four prequels, beginning with Mind of My Mind (1977) and finishing with Clay’s Ark (1984). Although the Patternist series established Butler among the science fiction elite, it was Kindred (1979), a story of a black woman who travels back in time to the antebellum South, that brought her mainstream success. In 1985, Butler won Nebula and Hugo awards for the novella Bloodchild, and in 1987 she published Dawn, the first novel of the Xenogenesis trilogy, about a race of aliens who visit earth to save humanity from itself. Fledgling (2005) was Butler’s final novel. She died at her home in 2006. 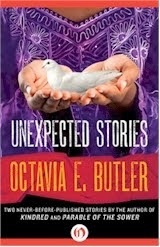 New, from Open Road Media, Unexpected Stories contains two never-before-published stories from Octavia E. Butler. The novella “A Necessary Being” showcases Octavia E. Butler’s ability to create alien yet fully believable “others.” Tahneh’s father was a Hao, one of a dwindling race whose leadership abilities render them so valuable that their members are captured and forced to govern. When her father dies, Tahneh steps into his place, both chief and prisoner, and for twenty years has ruled without ever meeting another of her kind. She bears her loneliness privately until the day that a Hao youth is spotted wandering into her territory. As her warriors sharpen their weapons, Tahneh must choose between imprisoning the newcomer—and living the rest of her life alone.